We produce and sell starter bee colonies called “Nucs” (short for nucleus hive) using our own queens developed from survivor strains adapted to Central New York’s long cold winters with genetics for gentleness, surplus honey production and disease /parasite resistance due to being raised in a chemical-free environment. Prices for 2017 are $120 each at time of pickup in Pompey, NY (Syracuse area). Each Nuc comes with one of our Northern bred queens of Carniolan lineage and because we produce them ourselves, rather than making nucs with purchased queens shipped from the South, our Nucs are not available until late May or early June. 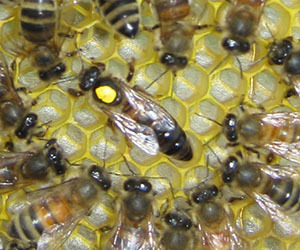 Each nuc comes with five medium frames consisting of a queen, 2-3 frames of eggs/brood plus frames of pollen and honey. We supply the bees and frames, you are responsible for the remaining equipment (hive body, bottom board and cover. Check out our Starter Guide under Beekeeping Resources). If borrowing a plastic nuc box for transport home there is a $25 deposit until returned. 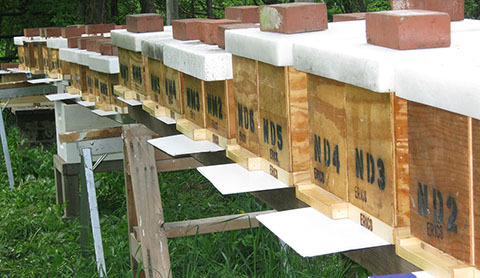 If you use traditional deep brood boxes, we will provide instructions on the simple process of migrating them from medium to deep frames.